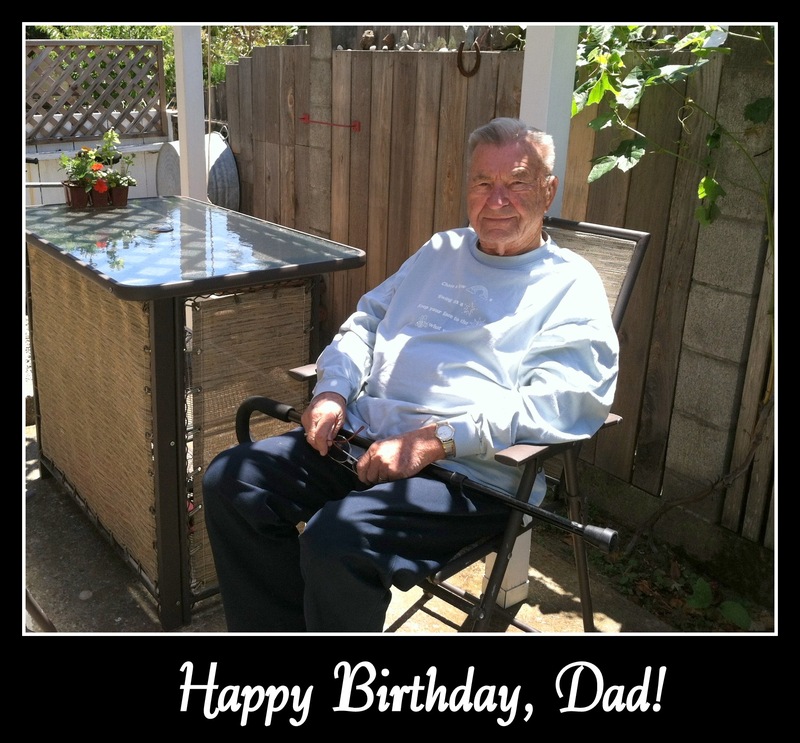 I’m honoring my Dad’s 94th Birthday today! in his church and is still going strong! I didn’t make it myself. but this cake is not my specialty, it was Mom’s. Remember that? I think Mom really enjoyed my attempt and had a good laugh! and for being Mom’s true love. WE LOVE YOU AND WISH YOU A HAPPY 94TH! How sweet Lauren. Dad looks good and I wish him a Happy 94th and for more birthdays to come. Thanks so much, Kim, for your kind words and birthday wishes! Awww Happy Birthday to Your Dad Lauren, and how lovely to be so active at this spritely age 🙂 Congratulations to your Dad, and yummy looking Cake..
enjoy your birthday celebrations as the loving family you are..
No one does it or shows it better! Tell your Dad, I wish Him a wonderful birthday and may he see many more healthy ones to come. He is looking good Lauren…Blessings to your Dad! Now I must ask, what is Blitz Torte? I’ve never heard of it – judging by the picture it is some kind of heavenly meringue and cake concoction? Thanks so much, Pooky! He has aged very well, I think, too! 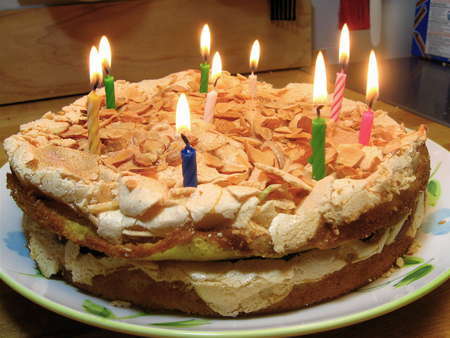 🙂 A Blitz Torte is a torte (cake) that is like a vanilla flavor with custard filling and meringue on top. The last time I attempted to make one, I don’t think I whipped the egg whites long enough, because the meringue came out cracked! Seriously, we live in CA, so I called it the California Quake Cake! lol My parents loved it anyway and had a good laugh! It’s very good and my Mom has always made it for Dad on his birthday. Sadly, she passed over a year ago, so I know it’s tough for him…thanks for stopping by! It sounds like you invented a whole new kind of cake! I’m going to have to try making a Blitz Torte – I made my husband a 5 layer chocolate brownie and meringue cake with raspberry cream for his birthday. It was RIDICULOUS! What a lovely Happy Birthday present. How lovely, happy birthday to your Dad, he must give my Dad tips on how to look so well at 94 ;). My Nana is just getting into blogging and Facebook she was scared about breaking her laptop at first but now she loves it. She’s doing great and feels much more comfortable now and so do her parents! 🙂 I just watched the video and your performance is just gorgeous! Wow! I also “liked” your page, so I’ll look forward to listening to more of your beautiful voice, too! Thanks again, for stopping by! Joy and blessings to your dad, dear Lauren! What a grand occasion. Hurray for wonderful fathers! Thanks so much, Kathryn! It’s not everyday we turn 94, so it was a grand occasion! 🙂 Hugs! Happy Birthday to your Dad, he looks as though he is still in his late 40,s, hope I look as good as him at his age. Thanks very much, Ian, and your complement will definitely make his day! 🙂 He does look good for his age and I don’t know the answer yet. I’ll have to ask him again! Thanks for your birthday wishes! 94? That’s amazing that he’s still so active and healthy. I was born on the same day, and my father was born one year after your father. Yes, it is amazing, Binky, and wow, that is coincidental that you and your father’s birthdays are the same, too! Great day to be born! 🙂 Thanks so much for stopping by! That’s so nice. I hope he had a great birthday! With a cake like that and so much love, it would be hard not to. What a great-looking Dad you have, Lauren. You are both blessed to have each other as Daddy and daughter in this lifetime. Please greet him Happy Birthday,with my wishes for a lot more of healthy years to come! Hugs and many blessings to you,dear sis!. And this post is really cute too, Lauren. Big hugs and I hope you all had a great time for his birthday! Thanks, Cha, I’ll let him know that he’s pretty cute! 🙂 Yeah, 94, it still amazes all of us! We couldn’t believe it when he wanted a fb, but we helped him and it’s one more thing he can do…thanks for the hugs, we had a great day and sending hugs to you, too!